Christine Carda began writing professionally for Meridian One Technologies in 2009. In 2004, her literary essays earned her scholarships to both Arizona State University and the Metropolitan State College of Denver. Her expertise in extensive research ranges from psychological disorders to Postmodern philosophy. She is pursuing Bachelor of Arts degrees in psychology, philosophy and journalism at Arizona State University. Cholesterol is a "sterol present in all animal tissues," according to the United States Department of Agriculture's 2005 Dietary Guidelines for Americans. Heart-healthy nuts like pecans and pistachios grow on trees and are, therefore, cholesterol free. Most nuts are replete with essential vitamins and minerals and play an important role in lowering bad cholesterol and reducing the risk of coronary disease. The health benefits of consuming certain nuts are well documented. In fact, the United States Food and Drug Administration issued a "qualified health claim" in 2003 that states, "scientific evidence suggests but does not prove that eating 1.5 ounces per day of most nuts as part of a diet low in saturated fat and cholesterol may reduce the risk of heart disease." Almonds are among the nuts that received the Food and Drug Administration's certified health claim of 2003. Almonds are the nutrient-rich fruit seeds of the prunus dulcis tree. These nuts are also an excellent source of fiber and healthy monounsaturated fat. In addition to being replete with essential vitamins and minerals, almonds also contain high levels of protein. Walnuts provide the body with essential omega-3 fatty acids that are shown to support cardiovascular health. In May of 2009, the "American Journal of Clinical Nutrition" published findings from a study that documented the benefits of eating walnuts on the physiological processes of the human body. 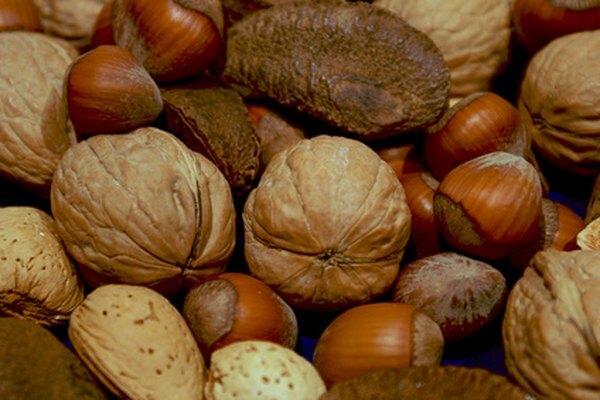 The study concluded that subjects who had walnut-enriched diets demonstrated "significantly decreased total and LDL cholesterol for the duration of the short-term trials." Hazelnuts are rich in polyunsaturated, or "good," fats and vitamin E. The vitamin E in hazelnuts acts as a powerful antioxidant. The cleansing properties of vitamin E help the body rid itself of harmful free radicals that can lead to disease. Adding hazelnuts to a healthy diet also "reduces your risk of developing blood clots that can cause a fatal heart attack," states the Mayo Clinic.